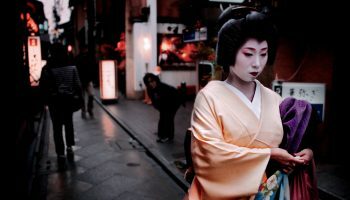 In Japan, Kyoto is one of the more brilliant albeit crowded locations for viewing beautiful cherry blossom scenes in spring. 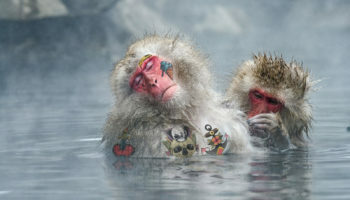 The prefecture’s ancient shrines, temples, and rivers are the oh-so-scenic backdrops to your cherry blossom experience — set to start in late March in 2019. 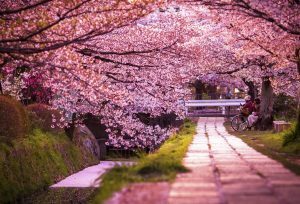 Walk through a tunnel of blossoms at this beautiful spot south of Kyoto City, where cherry trees line a path that runs along the top of an embankment between the Kizugawa and Ujigawa rivers. 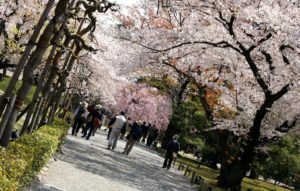 About 250 cherry trees line the 1.4-kilometer promenade in the Sewaritei District. Gaze at the petals from spacious lawn areas or from a 25-meter-high viewing post. 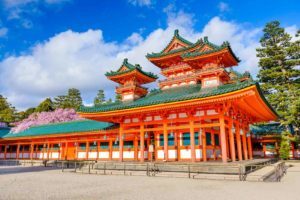 Go higher still by scaling the nearby cherry tree-covered Mount Otokoyama to visit the Iwashimizu Hachimangu Shrine. 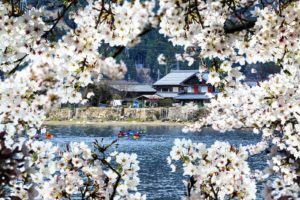 This lesser-known World Heritage Site is famous for omuro sakura cherry trees, which are said to be the latest blooming cherries in the whole of Kyoto. 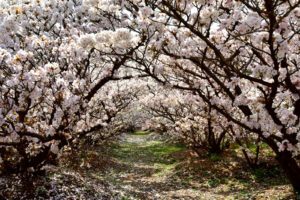 The forest of these trees in the inner grounds reaches a height of only about two to three meters, bringing the blossoms closer to the ground for great portrait shots. 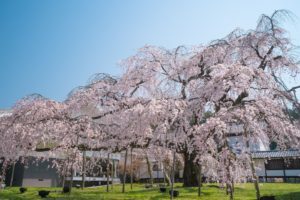 You will also find trees of the mainstream somei yoshino variety in front of the main hall and weeping cherry trees near the bell tower. Hirano Temple festival grounds turn into a magical nighttime scene. During the Edo period, the night viewing of cherry blossoms at this shrine became famous throughout Japan, and the tradition continues today. Its grounds feature a mind-blowing array of cherry varieties, totaling about 60 types among 400 trees. 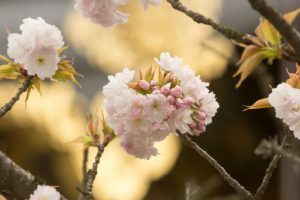 The early-blooming nature of the sakigake variety that originated at the shrine led to the old saying that when it starts to blossom, then the cherry-viewing season in the capital has begun. The later-blooming trees here extend the blossom parties through to mid-April. 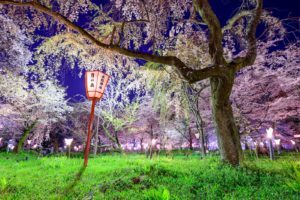 Night view: March 25 – April 20 until 9 p.m.
One of the most popular and pleasing of Kyoto’s cherry blossom spots is Philosopher’s Path, a stone pathway that runs alongside a canal lined with hundreds of cherry trees. The roughly two-kilometer route begins around Ginkaku-ji (the Silver Pavilion) and ends near Nanzen-ji Temple at the southern end. Step into the sumptuous garden here and you’ll soon be enveloped in a canopy of cherry blossoms. 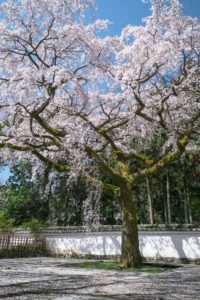 The 30,000-square meter garden is a nationally designated site of scenic beauty famous for its weeping cherry trees— most of which were planted back when the shrine was created in 1895. Be sure to visit the east garden for views of more blossoms reflected in Seiho Lake. Night view: April 4-7; 6:15 p.m. to 9 p.m. Ticket for Heian-jingu Benishidare Concert required. 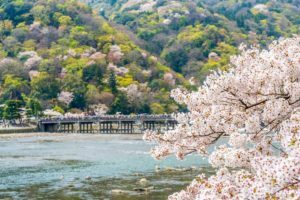 For blossom viewing on a grand scale, head to the Arashiyama region, where cherry trees turn the eponymous mountain a patchwork of pink and green. This view, with the Togetsukyo bridge in the foreground, is one of the most famous vistas in Japan. 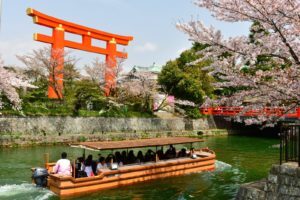 Cherry trees also line the Katsuragawa river and more can be found in Nakanoshima Park on the western riverbank. 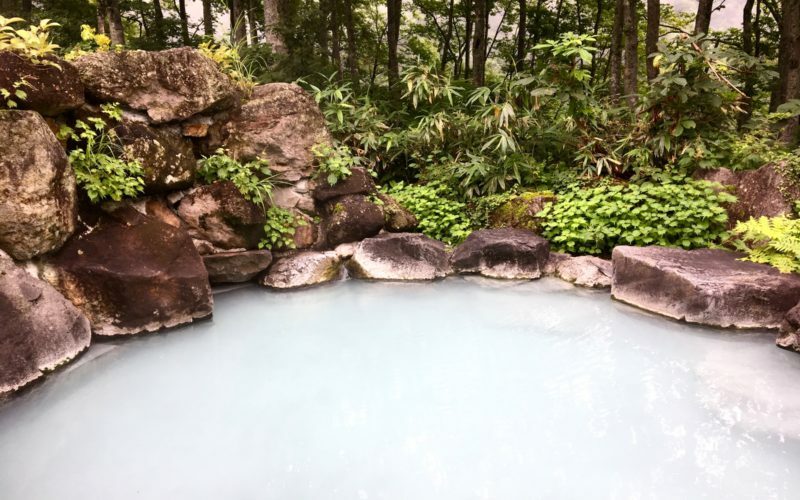 Consider stopping in at the nearby Tenryu-ji Temple— a World Heritage site famous for its beautiful garden, which includes about 200 cherry trees. 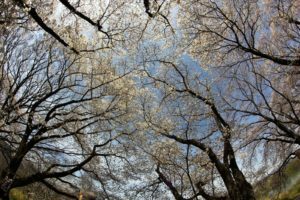 Night view: This year, trees in the Nakanoshima area with be lit up from dusk until 10 p.m. when the blossoms are at their best, sometime between late March and early April. 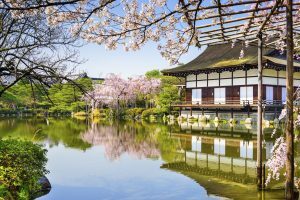 The oldest park in the city was also the first to become a famous site for cherry blossom viewing in Kyoto. 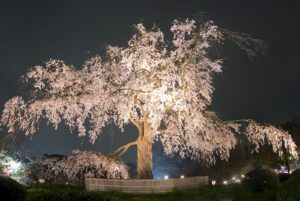 Among the park’s 680 cherry trees, the headliner is a towering old weeping cherry that is the centerpiece of the park’s nighttime illuminations. 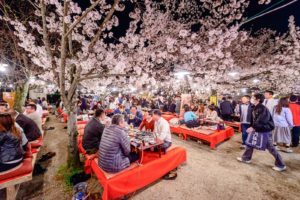 It’s a popular place for nighttime blossom-viewing parties, with food stalls both there and in the adjacent Yasaka Shrine. 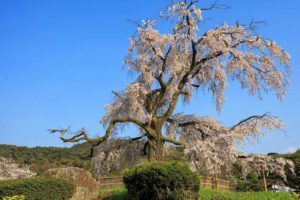 There are around 400 cherry trees of about 50 varieties throughout the exquisite grounds of this beautiful wooden castle, including blossom-lined paths and an orchard of a late-blooming cherry variety. 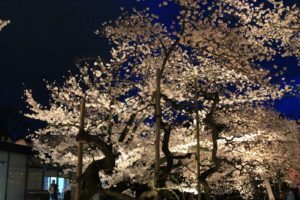 Both the flowers and the historical buildings at this World Heritage site are illuminated at night during the cherry blossom season, making for some very special sightseeing snaps. Night view: March 21 - April 14; 6 p.m. to 9 p.m. 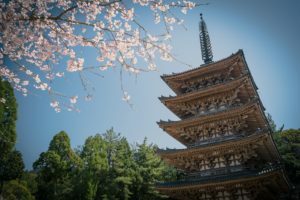 This temple is named after a grand cherry blossom-viewing party held by samurai warlord Toyotomi Hideyoshi in 1598 when he had 700 trees planted there to gaze at. Now there are more than 1,000 over the vast temple grounds that include the mountain behind it. 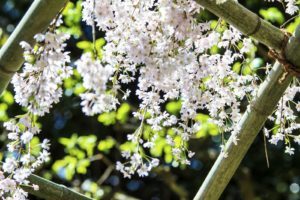 Varieties here include early-blooming cherry trees and many weeping cherries. A parade commemorating that grand old cherry party is held annually on the second Sunday of April. 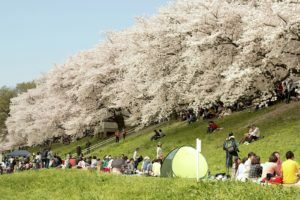 “Ho-Taiko Hanami Gyoretsu" (Toyotomi Hideyoshi’s cherry blossom-viewing parade) is held the second Sunday of every April. Avoid the worst of the crowds by heading to this path along the Nanatanigawa River in nearby Kameoka City. It is lined for about a kilometer by some 1,500 cherry trees. 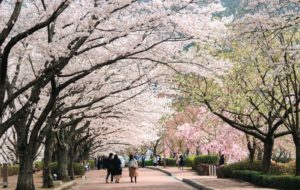 There are more still in the adjacent Sakura Koen park, which features 280 cherry trees in 28 different varieties. 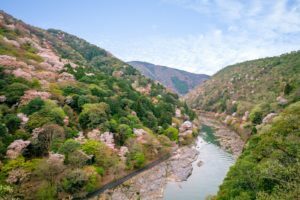 Kameoka is the starting point for the Hozugawa-kudari riverboat ride, which ends at Arashiyama and is an exciting way to view riverside cherry blossoms. Night view: March 25 - April 16; 7 p.m. to 10 p.m. Recommended viewing periods are approximate, depending on the weather. 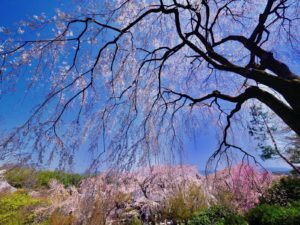 Many of the blossoms in Kyoto bloom earlier or later than the typical “somei yoshino” type, which stretches the fleeting viewing season a little longer. Expect crowds and go early to try to avoid them, or visit the out-of-town options at the top and bottom of the list.